[drove] the iron against the left side of the face, immediately anterior to the angle of the inferior maxillary bone. Taking a direction upward and backward toward the median line, it penetrated the integuments, the masseter and temporal muscles, passed under the zygomatic arch, and (probably) fracturing the temporal portion of the sphenoid bone, and the floor of the orbit of the left eye, entered the cranium, passing through the anterior left lobe of the cerebrum, and made its exit through the median line, at the junction of the coronal and sagittal sutures, lacerating the longitudinal sinus, fracturing the parietal and frontal bones extensively, breaking up considerable portions of brain, and protuding the globe of the left eye from its socket, by nearly one half its diameter. The rest of the story is well-documented. Gage apparently, and slowly, recovered from this wound and lived for another 12 years. During the time, he succumbed to various motor and neurophysiological difficulties. In fact, the strange case of Phineas Gage is often used to illustrate the effects of a severe brain injury. Images of Phineas Gage's Injury (Source: Malcolm Macmillan, "Restoring Phineas Gage: A 150th Retrospective, Journal of the History of the Neurosciences 9:1 ). But for the purposes of this piece, its not the the strange circumstances that hold our interest. Rather, it is the hole caused by the errant tamping iron. 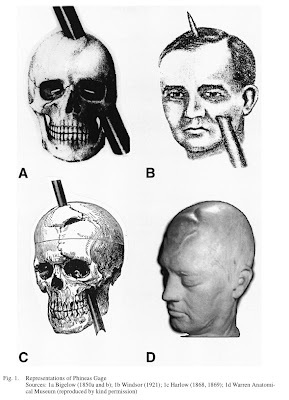 In fact, it is only a series of representations -- a photograph of Gage's skull (see above image), and drawings showing the tamping iron in mid-trajectory through the head -- that give us any sense of the physical consequences of Gage's injury. These representations of damaged crania are necessary, for the subsequent medical records are apparently ripe with contradictions and errors. Gage's injury reminds us of another famous head injury, this one from Bram Stoker's Dracula. In Chapter 20 of the novel, Renfield, the insane asylum inmate who eats vermin and other small animals, falls victim to Dracula's powers of hypnosis. Dracula, who has the power to control animals, offers Renfield an endless supply of food, provided that Renfield worship him in return. He capitulates, yet when he understands Dracula's real motivation for this bargain (to possess the innocent Mina Harker), Renfield refuses. Some type of altercation occurs, and in Chapter 21, Renfield is discovered with a bloody, suppurating wound to the head and a broken back. Van Helsing is called in, and after quickly ascertaining the situation, realizes that he must trepan Renfield's skull at the "motor area", presumably Broca's Area, the part of the brain that deals with speech. In a ghastly bit of surgical prowess, Van Helsing removes part of the skull, and Renfield is able to give the doctor some vital information about Dracula's shape-shifting abilities, as well as his ulterior, and deeply sexual motives. Unfortunately, Renfield dies. 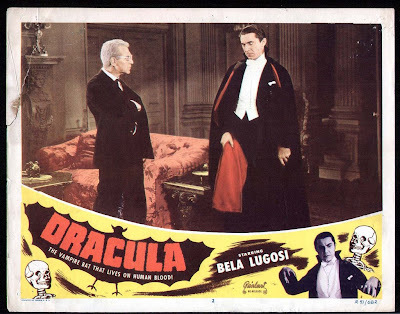 But some good has come of this, for Dracula has burned all written records regarding his visit and his affairs, and there would otherwise be no possible way to hunt down the murderous Count. So here we have two skulls -- each bears its own type of testimony ... a testimony brought about by blunt force trauma. In the case of Phineas Gage, the actual injury to the skull (as shown by the entrance trauma underneath the zygomatic arch), corrects what has been a faulty record of this horrific injury. On the other hand, as Friedrich Kittler has remarked in Draculas Vermächtnis (Dracula's Legacy) (1993) Van Helsing's cutting into Renfield's skull with a toothed saw is an instance of data and information retrieval. He is literally accessing Renfield's data storage "port". The access to this information leads ultimately to Dracula's demise. I echo Laurie Anderson's dictum, "It's not the bullet that kills you ... it's the hole", and only point out that holes in Gage's and Renfield's skulls provide a type of evidence that can meet the most stringent burdens of proof.